Italian Lifestyle and Potato Salad – Got Nourishment? A quick cappuccino to start off the day and a light bite to eat. A long leisurely lunch with family and friends, followed by a macchiato or espresso. Walking or biking instead of driving. Home cooked meals. How can we incorporate this lifestyle into our own lives? I can tell you one thing. It doesn’t require flying half-way around the world. This obsession with Italian lifestyle and culture began after a month long study abroad in Florence. Ever since, I have been hanging on to threads of the lifestyle I had there. The reason behind my obsession, other than the obvious breath-taking views, quaint towns, and buttery pastries, is the slowness. Slow meals, slow conversation, slow cooking, …you get the point! One main thing that I would like to focus on is cooking at home. I am guilty of grabbing a quick bite to eat and getting back to whatever my busy schedule contains. Cooking at home opens many doors! First, it will make you slow down. You will have to pick a dish, shop for ingredients, and take the time to prepare a meal. Second, it’s healthier. Restaurants and fast food joints have menus that are loaded with salt, sugar, calories, and fat. It has been proven that those who cook at home tend to eat less calories, fat, and sugar than those who often eat out. Third, it’s usually much cheaper (stay tuned for my tips on cooking delicious and nutritious meals on a budget). Last, but not least, it’s often therapeutic to cook after a long day. 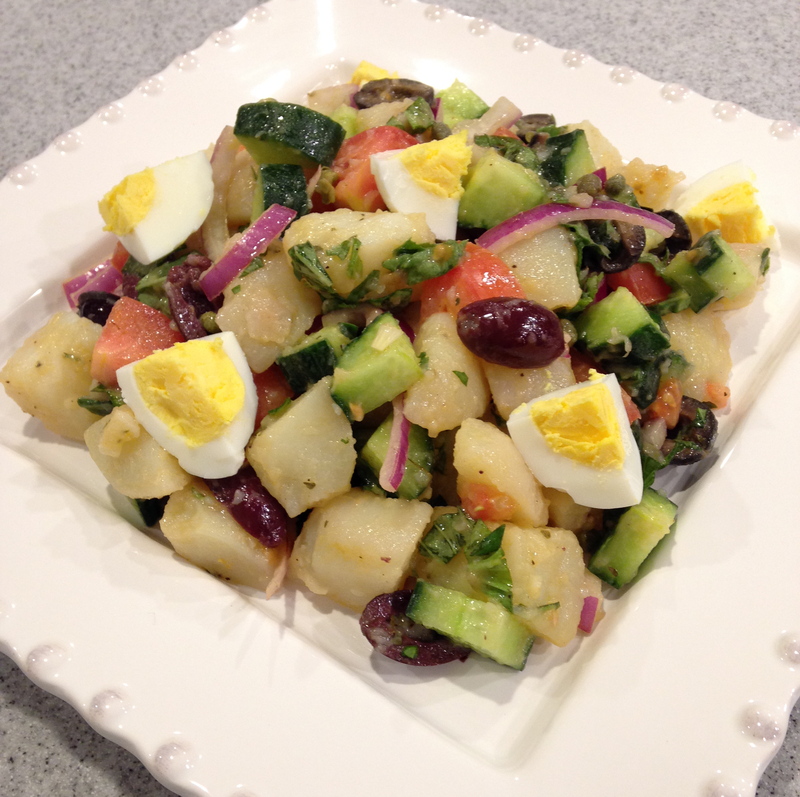 Now, sticking with the theme of Mediterranean fare, as well as with the Mediterranean issue of Bon Appetit, I found a delicious potato salad recipe! Not your typical mayo laden recipe, this potato salad has a light olive oil and white wine vinegar dressing. This particular recipe is popular in Pantelleria, an island southwest of Sicily, Italy. Enjoy as a main dish or side salad! Cook potatoes in boiling salted water until tender, about 30 minutes. Drain; cool. Peel potatoes, cut into 1-inch pieces and place in bowl. Add oil; toss to coat. Add cucumber, tomatoes, onion, olives, basil and capers. Whisk vinegar and oregano in bowl; mix into salad. I suggest adding half of the dressing and taste before adding the rest. Season with salt and pepper. Garnish with eggs and serve.